GAB – 18 AWARDS AND COUNTING! It was a night of celebration for Guinness Anchor Berhad (GAB) as the brewery took home three awards at the Putra Brand Awards held at Majestic Hotel. Heineken received a gold, and Tiger Beer garnered a silver in the Beverage-Alcoholic category, bringing GAB’s total tally from the prestigious awards ceremony to 18 wins over six years. To further solidify GAB’s victory, Heineken was inducted into the Putra Brand Icon Hall of Fame for winning its fourth consecutive gold award. 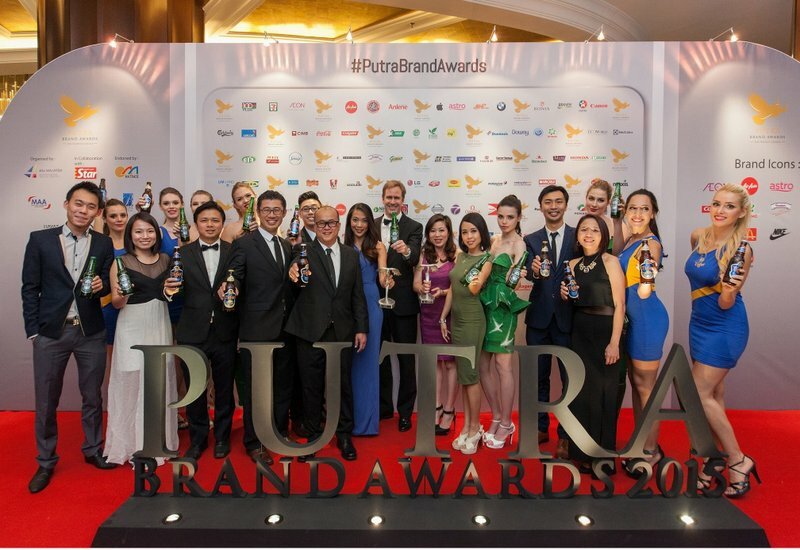 Introduced in 2010 as an extension of the Malaysia’s Most Valuable Brands (MMVB) programme, the Putra Brand Awards is a prominent annual brand valuation and recognition exercise organised by the Association of Accredited Advertising Agents Malaysia (AAAA). Hans Essaadi, Managing Director of Guinness Anchor Berhad said, “At the heart of GAB is our portfolio of world-renowned brands. However, with our consumer base being so diverse and evolving so quickly, we constantly up our game by expanding our portfolio to maximise opportunities. GAB’s core brands have certainly come a long way since they were launched in Malaysia. Today, apart from having iconic status; they have also come to be known for being host to world-class marketing campaigns. This year, Heineken embarked on the launch of its new Heineken Star can. As part of the global rollout, by the end of 2015, almost every refreshing can of Heineken enjoyed in the world, will be the new Star can. The modern and progressive design conveys ‘sophisticated simplicity’ and follows in the footsteps of the recent redesign of the brand’s iconic bottle. Apart from the launch of the Star cans, Heineken recently unveiled its new “Imagine” campaign aimed to evoke discovery of the brand, which will culminate in a creative showcase that celebrates the brand’s iconicity and offers consumers unexpected experiences. Heineken engaged an eclectic mix of creative visionaries to create a series of cutting-edge work that both stimulates and inspires the imagination. Consumers are welcomed to be inspired by the showcase on 12 and 13 September 2015, 5pm onwards at Slate @ The Row, Jalan Doraisamy, Kuala Lumpur. While Tiger FC marked its 11th year of uniting real fans across Malaysia through its various Big Away Game viewing parties, Tiger Translate returned bolder and edgier the second time around. The event, which debuted last year, has already established itself globally as an arena that features unconventional collaborations of art and music. The adaptation here is no different as Tiger Translate continues to showcase creative “East meets West” efforts by local and international artists. All these consumer engagements reinforce GAB’s core brands’ positions – Heineken as the World’s No. 1 international premium beer, and Tiger Beer as the World’s No. 1 international Asian beer. During the recent Cannes Lions Festival of Creativity, Heineken was awarded the 2015 Creative Marketer of the Year. The accolade recognises companies who have distinguished themselves by inspiring innovative, global marketing of their products and who embrace and encourage creativity in their brand communications. With Heineken acquiring a feather in its cap on the local front with the recent coup at the Putra Brand Awards, this proved that the combination of passion for quality and constant drive for progress is shared by millions of fans throughout the world. Over the years, Tiger Beer has accumulated over 50 accolades, awards and distinctions. Some of the more notable awards include a gold medal in the International-Style Lager at the World Beer Cup 2010 and a gold medal for the International Golden Lagers category at the BrewNZ Awards in 2011. It was also named a UK Cool Brand Leader from 2004 to 2006, which reaffirmed its popularity as the title was given only to the coolest brands in the UK. This entry was posted in News and tagged beer, GAB, tiger by TheGoodGoodGuy. Bookmark the permalink.